The new warehouse stands proudly sparkling in the early morning mist. The familiar orchestra of men and tools drifts through the cold air as workmen busy themselves to add the finishing touches to the latest vital distribution link, in a major Supermarkets expansion through Eastern Europe. A precise specification is required to ensure that smooth logistical processes can flow through this building in just a few short weeks. This 11,000 square meter Distribution Centre must be open in time for the Christmas season, to provide the necessary supply chain improvements into the capital, Prague. The ambient temperature in the chamber is chilled down to 1 degrees Celsius – next door chilled fresh produce will be the first products through the doors. 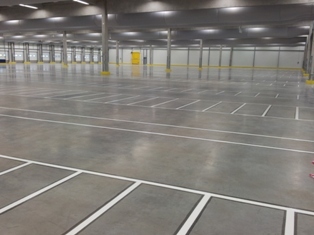 The floor line marking plan that will guide operations for the 200 employees working here must be precise, durable and easy to clean. The method chosen – DURALINE RAPIDSHIELD from inotec. An international 10 member team, headed by Richard Fitzsimmons and Vit Janecek have applied over 10,000 metres of lines within three weeks – ahead of program – utilising the latest UV Cure line marking technology. The hard curing UV coatings are able to withstand the harsh conditions of the fast moving goods in goods-out processes for up to 5 years. Food Safe colour coats and VOC free Top coats are applied to the specially prepared floor slab – ensuring a strong and perfect bond to the floor. The RAPIDSHIELD clear top coat adds unrivalled durability and protection – offering a smooth hard surface that is resistant to chemicals, abrasion and easy to clean and maintain. Using the latest in Ultra-Violet lamp technology, the surface is instantly cured and can be handed back to the Warehouse immediately causing minimal disruption to operations. A decisive advantage compared to conventionally known lengthy curing processes. At 20.00Hrs the crack team of inotec line marking specialists leave the site again – they have completed the first phase of the works ahead of schedule. The satisfied client is already using his new high quality lines installed by inotec Barcode Security. The New Year promises to be a busy one for inotec Barcode Security , the specialists in floor coatings, Barcodes & RFID labeling solutions throughout Europe.